I can't believe that five years have already gone by since I launched Blogtown on 9/9/09! There's been so many stories to tell, so many events to cover, so much fun to relate ... and it just keeps getting better. Thank you to any and everyone who has ever read a story, suggested a story, starred in a story, or been touched in any way by a story ... that's why I do it. My original intent was to build community/world peace through getting to know each others' stories and lives a little better. You're much less apt to be a jerk to someone when you know their whole story, and vice versa. We're all in this together, and it's our job to make sure we have the very best stories to tell. Below is a re-post of my first Blogtown article/mission statement. Please feel free to chime in and let me know what stories you'd like to hear as we keep on rolling here in our beloved Venice. 5 ... I guess we go to Chuck E. Cheese or something tonight? Cheers! *And Congratulations to Lacey Kay Cowden whose debut ep, Go Great Guns, is available today! Exciting! A nickname for Venice, California is Dogtown. A nickname for me is CJ. I am a writer. 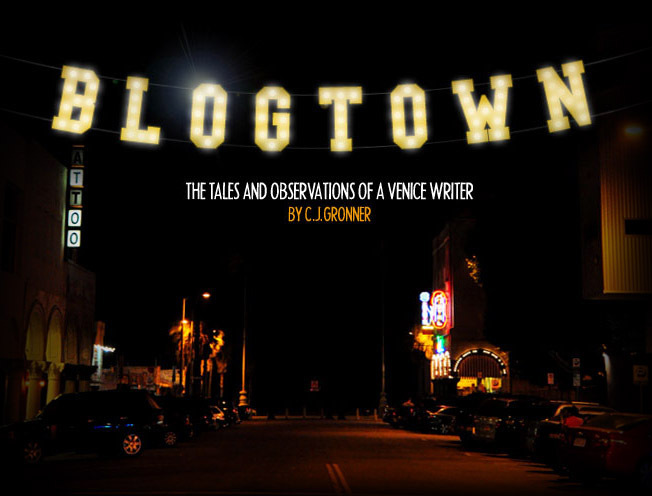 It didn't take much thought to get the animated light bulb over my head saying, "BLOGTOWN (by CJ)". Of COURSE! Over the years I've written a lot of articles, and people keep asking where to find more of my work, ala "Do you have a Blog?" I did not. So when that kept coming up, I realized I'd better get with the times (um ... really. I've got a lot of work to do in that vein - you should see my phone. I keep pleading, "It's Punk Rock", but it's truthfully more that I'm just slow with things like technology. That's a topic for another day, however. ), and here we are. I grew up in Minnesota, listening to Garrison Keillor and his Prairie Home Companion radio show. My hope for BLOGTOWN is that it can be a bit like the work of a younger, wilder, female Mr. Keillor, who tells stories and rants about the happenings of not Lake Wobegon, but the ones the little city next to the Ocean Pacific ... Venice. I've lived out here for 14 years now. I've supported local businesses pretty much exclusively. I've volunteer taught many of the neighborhood's children through Venice Arts. I stand in line to vote about street permit parking (Against, fyi). I am an involved Citizen, for sure. Most importantly, I've befriended everyone from my Can Collector folks to Famous Artists, and have found that all have equally fascinating tales to tell. To be born on 09/09/09 means in numerology that you will be filled with truth, justice, compassion and success (so says Google). It is my hope that this is true, for both babies and blogs. I'll look forward to sharing with you, and seeing you out and about. If you see me, please tell me YOUR story, because everyone has one. Thank you so much for visiting my life here, as we're all part of the same poem. As an old Venice saying goes, "Poetry is what Venice is all about. It ain't the only thing, but it's the fundamental thing." And away we go! Fun to reread article No.1!! You certainly have succeeded in carrying out your Mission Statement with so many wonderful articles!! You give so much good information on places people may (or may not) know, and get their story out there. Also alerting us of special events, art exhibits, books or music!! I['d like to see an article on your visits to Ingebretsen's Scandinavian Gifts and Deli in Minneapolis when you are home (fits into the category: " Sometimes I'll go on the road and tell you about other places and scenarios" to share with your Minnesota readers AND your Venice readers!! And it can illustrate why you love to go home, and how part of your annual party happens!! Abbot Kinney Street Festival 2014! The Fall Art Crawl - Best One Yet! The Jail Guitar Doors Rock Out 2!